Stampin' Up ideas and supplies from Vicky at Crafting Clare's Paper Moments: Stampin' Up catalogue 2014 sneak peek! Stampin' Up catalogue 2014 sneak peek! If you love Stampin' Up products, I really do encourage you to join Stampin' Up this month: There's a special offer until the end of June where you pay just £50 for your starter kit and get to choose £55 worth of products, with stationery, catalogues and postage included free! It's a great, no-risk way of seeing what it's like to join the Stampin' Up family and you're welcome to join as a hobby demonstrator or as a business demonstrator. Interested? Click here to find out more. There's this fabulous wavy paper. It's from a new paper stack called Moonlight, which features the five new in-colours. These stacks are always such brilliant value for card makers and for Project Life fans too (click here for details!) I've teamed the new paper with a contrasting piece from the Retro Fresh range in the summer catalogue. The word 'DAD' is spelled out with a gorgeous new photopolymer alphabet called Metro Type. I wanted this for Project Life but I can see it's going to be pretty handy for personalising cards as well. The star and the sentiment are in a bright, zingy new orange called Tangelo Twist. I'll be doing a whole post on the new colours soon so don't miss that! The star itself has been cut using one of the new punches from the Itty Bitty Accents punch pack. There's a new style of heart in the pack as well as the prettiest little flower ever! You'll definitely be seeing a lot of these punches on my blog! 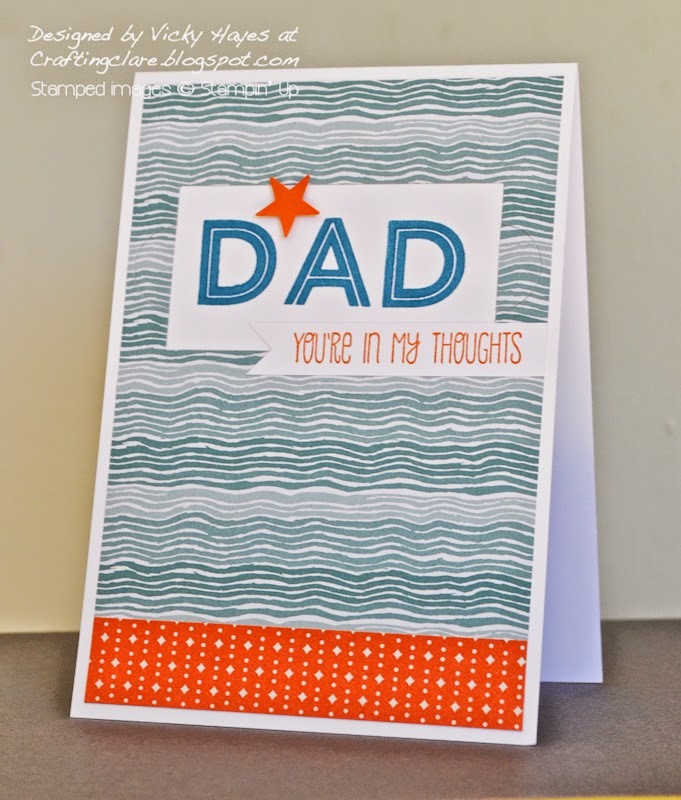 I'll be linking this card up with the Male Room where the theme is Father's Day and Make My Monday where the ladies are looking for male-themed cards. Me: It's not so much fun this year - I don't know who they are any more. DH: Well that's the Croatian manager. He's in a Roxy Music tribute band. DH: No, I just made that up. I'm trying to make it more interesting for you. I have the quickest, simplest Father's Day card for you tomorrow - perfect for those (like me) that suddenly needs a card right now! Terrific Father's Day card . . ..love those colours and waves. Is there a Footy World Cup on? I hadn't noticed . .. except for the blue air in the living room last night about the cheating and biased nature of the ref! Really fun Father's Day card - love the colours! I really enjoy the World Cup - we watched it here last night. I was hoping that Croatia would win, but there you go! Lots more fun to come :) I must have a go at a card in the colours of the nations. Gorgeous card and a great idea for cards in the nations' colors :) I'm quite sporty so will try and catch as much of the World Cup as I can. Love your colour combo - really bright and zingy! Thank goodness my OH has no interest in football! Thank you for joining us in The Male Room this week.